Mary Noble, one of the EASE Trustees, featured in our EASE News of July 2013 when she rescued and brought back to the UK a Golden Retriever (Pasha) who had been kept caged in an Istanbul hotel petting zoo. Pasha has since become a happy and affectionate dog, living with me and my other dogs in Hertfordshire. 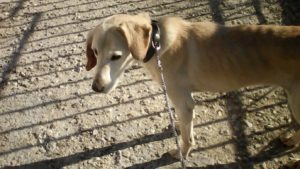 However, sadly Mary’s latest canine adventure was not to have such a happy ending..
Mary was recently visiting Greece, and shared with us this moving story about a street dog she came across while there. “We were staying in a lovely spot by the sea, very near the village where our two friends Theodora and Frits live (an hour and a half’s drive from Athens) and on most days we went up to the local taverna with the others for lunch. On the first day, we found a beautiful, but skeletally thin, female golden Labrador, huddled under the stairs in the car park, clearly starving, and with what looked like a very bad ear infection. “She was so hungry that when we started to feed her she accidentally bit Bruno when there was no more food in his hand, so after that we felt we had to go back each day and feed her. So this we did for about six days, and she looked happier each day, her tail wagging furiously as we would drive up to the car park where she would be waiting for us. But she was clearly in a lot of pain with her ear, and didn’t want to be touched. She was wearing a small plastic collar and the taverna owner, whom I talked to, said that she was probably just thrown out and abandoned in front of his taverna – which is quite common. The sense I had was that she was used to humans, but also very hurt. The dog had a nasty festering ear infection, and the vet was of the view that she was probably about two years old, having already had a litter of puppies, and was probably dumped by the road not long after giving birth. She was cared for by the local vet for some days before being taken home by Theodora and Frits, to be looked after alongside their own pets. For a week or so they took exceptional care of this lovely dog, whom Mary had named Coco, feeding her many times a day to build up her strength, walking her in the local area and building her a den of her own to allow her to feel safe. Coco responded to this attention very well, growing daily in confidence and affection, and clearly relieved at becoming more free of pain and stronger as each day passed. Theodora, who is a teacher at the local junior school, kept her children up to date about Coco’s progress, and some of them were even able to meet her – offering them a first-hand living example of the kind of humane care that can be extended to the Little People. However, after a week or so Coco started to go downhill rapidly, and further visits to the vet resulted in a biopsy being taken and sent to the Royal Veterinary College in Hertfordshire, UK for analysis. The results of this were heart-breaking – it transpired that Coco had a huge malign tumour which was preventing her eating and walking, and the only option was to euthanise her to relieve her suffering. This was kindly and carefully carried out, and Theodora made arrangements for Coco to be buried with respect and affection. This in its turn was also shared with the school children, giving them a great education about how people can treat animals with respect. In Greece a dead animal will often just be thrown away in the garbage, so for these children to learn that Coco was being buried with dignity became an important part of their education about the possible human/animal relationship. We will never know exactly what happened in Coco’s short life, but at least we know that her last weeks were spent being graced with human love and kindness, and that she played a part in demonstrating to children how the Little People can be treated with respect and dignity. Her spirit will live on in the memories of all those she touched in those last few valuable weeks of her life.